Home » show and tell » Remember zigzag blocks? I finally found a project for the zigzag blocks. 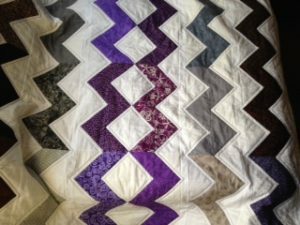 The Minnesota Quilters President’s Challenge this year is a twin quilt for a program that helps homeless youth, many who have aged out of the foster system, develop their skills. Each young adult gets an apartment and can select basics such as dishes, pans, bedding, etc. Hand made items are a big hit. Often kids can’t believe that someone cared enough to make them something. The quilt and household items stay with the kids when they ‘graduate’ the program. 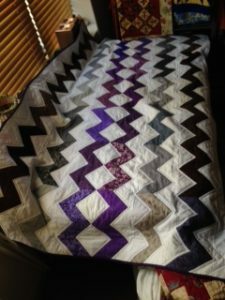 I’ll make a pillowcase to go with it as I have 2 more zigzag blocks. Here is “Life Is Not a Straight Line.” It’s much brighter than the photos. Thank you Block Lotto!! What a wonderful way to use your winnings. I make a lot of charity quilts also, and Block Lotto blocks are often my basis for a charity quilt. What a great program … and aren’t you great for making this quilt for them!